Apple Chief Executive Tim Cook earned about $378 million in 2011, making him the highest-paid CEO in the U.S. based on one new analysis. But Cook won't be able to actually collect all of the money unless he stays at Apple for 10 years. Cook's earnings last year were mostly from a one-time stock award of $376.2 million that extends over 10 years. In addition, his salary, perks and bonuses amounted to $1.8 million for the 12-month span, as highlighted in a profile by The New York Times. While the Times suggested that Cook earned $1 million a day last year, the truth is he won't see most of the money for many years. 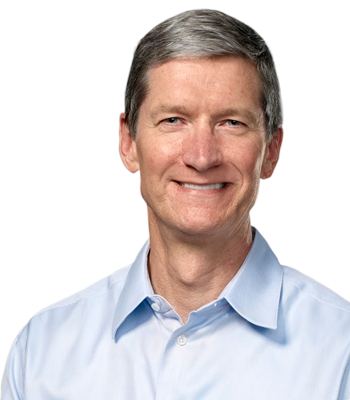 The stock awarded to Cook in 2011 requires that he stay at the company for 10 years, which instead amounts to $103,000 a day if he were to fulfill that requirement, as noted by Philip Elmer-Dewitt at Apple 2.0. In fact, Apple's own 2012 proxy statement filed with the U.S. Securities and Exchange Commission states that Cook's compensation should be viewed "over the 10-year vesting period and not solely as compensation for 2011." While Cook was awarded $376.2 million in AAPL stock in 2011, he didn't see any of it last year. Instead, his annual salary was just $900,000, well less than the median total compensation of $14.4 million for U.S. CEOs last year, as reported by the Times. If the total stock compensation is included, Cook's earnings in 2011 were well beyond second-place finisher Larry Ellison of Oracle Corp., who made $77.6 million last year. In third place was former Apple retail chief Ron Johnson, who made $53.3 million in his new role at U.S. retailer JC Penney. In fourth on the list was Philippe Dauman, CEO of Viacom, who earned $43.1 million. Honeywell's David Cote took fifth with $35.3 million, and Stephen Chazen of Occidental Petroleum was sixth with $31.7 million. In seventh was Bob Iger, Disney's chief executive, who earned $31.4 million in 2011. Last November, Iger joined Apple's board of directors, and he also worked closely with late Apple co-founder Steve Jobs on content deals, while the two presided over Disney's 2006 acquisition of Pixar. Rounding out the top ten were Marathon Oil CEO Clarence Cazalot Jr. ($29.9 million), Ford Motor Company's Alan Mulally ($29.5 million), and News Corp. Chief Executive Rupert Murdoch ($29.4 million).